Tonight I made Bryanna Clark Grogan's "Breast of Tofu." I made some steamed bok choy with gomashio & some rutabega oven fries too. The breast of tofu was pretty yummy. I only marinated the tofu for one afternoon, I probably should have done it for longer, but it was still good. The slices are breaded and then lightly fried. I've never done that before, and it was yummy. Also, I saw Urban Vegan's sad posting about POM juice, and so I was especially happy to find some 100% organic fresh pomegranate juice at the farmers' market. Man, this stuff is SO GOOD. It's like eating a fresh pomegranate. yum! That's a funny name for a tofu dish, but it looks and sounds wonderful anyway. I saw UV's post as well--I'm glad there are cruelty-free alternatives out there! Bok choy for brekkie sounds right up my alley. Fresh pomegranate juice? Yum! So much tastier--and kinder--than POM. now if I could only get them to eat bok choy.. I Love that stuff my self! I tried the tofu breasts from another blog, which probably came from Bryanna, and I liked it pretty good. But I really prefer baked tofu steaks, as I like to call them - or filet-o-fu! The plate is lovely with the fries and bok choy! I'm going to look for some pomegranite juice at my farmers market tomorrow. Great dinner. Mmmm, bok choy. I associate fresh pomegranate juice with my uncle's house in Los Angeles, since I only get to drink it there. He buys it from a local farmer's market like you, and it is DELicious. I love tofu, and yours looks so good! I love the gomasio on the bok choy too! I know, what a funny name, huh? But these little tofus are very very yummy... I ate all the leftovers today! Yummy snacks. Hee hee... actually, bok choy does sound like a good breakfast food, doesn't it? And thanks again for the POM info. 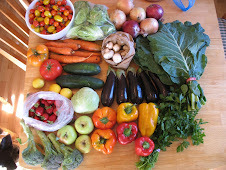 This stuff from the farmer's market isn't too cheap - but at least it's organic, local, and (best of all) cruelty free! 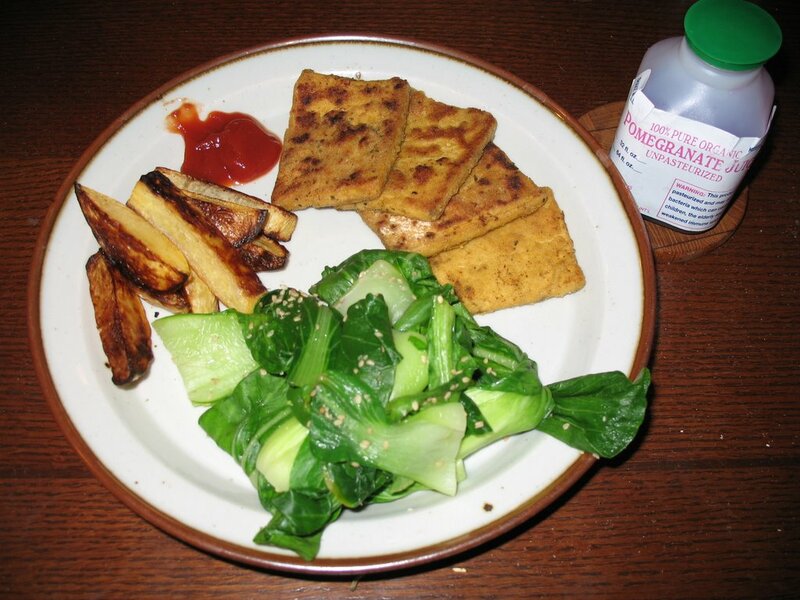 I can see that bok choy might be a bit of stretch for the kiddos, but that Breast of Tofu is just amazing. So good! Yeah, I was thinking that it might be nice to make this recipe... except bake them first, then bread them and grill them up. I also really like the texture of baked tofu. I hope you find some pomegranate juice at the market! Is pomegranate juice at the farmer's market a california thing? I definitely think of Persians enjoying pomegranates... I'm already dreaming of all the fun things I'll do for NoRuz this year. Yum! I hadn't ever used gomasio before, but it was yummy. Especially on bok choy. Bok choy has such a nice flavor, and the gomasio was a nice compliment. Also, this particular pomegranate juice is really amazing - it tastes JUST like a fresh pomegranate... without all the hassle of the seeds and effort. That pom juice rocks! Althought that little container wouldn't work for me. I could drink a gallon og that. YUUUUMMM! Thanks for the info on the juice. I just bought some the other week, but never again! Yes, I know what you mean about the small container. I hadn't ever bought it befor, and the big containers were somewhat pricey... so I decided to start with a little one. I think next week I'll get a bigger bottle! The rutabega fries are pretty tasty. My boyfriend is absolutely nuts for them. Rutabegas make a more moist, dense oven fry than potatoes. I would say that the flavor is a tiny bit more bitter than a potato, but also sweeter and more complex. I first started making these when my former CSA (weekly produce box) gave us a bunch of rutabegas. This year, I decided to go to the farmer's market instead of get the box... but after doing the box for a few years I really learned to try a lot of new veggies! It's very odd a juice company would test on animals. Good thing there are great local juices like the one you got at your farmer's market!